Set on the iconic Sunset Strip, 1 Hotel West Hollywood is ideally located for exploring neighboring Beverly Hills, Hollywood, and beyond. LA's top attractions and airports are within 15 miles. Breathtaking views, natural design and a prime location in the heart of West Hollywood — 1 Hotel West Hollywood has it all. This chic eco-hotel invites you to refresh and recharge in the lap of luxury. Floor to ceiling windows frame views of LA and the Hollywood Hills inside each of the 286 guest rooms and suites. Thoughtful touches bring nature into your space with native greenery, reclaimed wood, clay tones, marble bathrooms and 100% organic cotton sheets. Mealtime is the best time at 1 Hotel West Hollywood. Savor the bounty of California with every bite and sip at the hotel's signature restaurant, breathtaking rooftop bar and all-day cafe run by Chef Chris Crary. Or, spend your day poolside with refreshing drinks and light fare from the pool bar. The hotel's daily market stand is where you'll find fresh fruits, nuts, granola and more. Send an availability request with your requested dates to the 1 Hotel West Hollywood. Features 1 King bed, Sunset Boulevard view, HD Smart TV, cotton robes, yoga mat, organic bedding, Nespresso machine, digital newspapers, Bluetooth speaker, full-length mirror, in-room greenery and complimentary Wi-Fi Internet. Features 1 King bed, panoramic windows, LA views, sitting area, HD Smart TV, cotton robes, yoga mat, organic bedding, Nespresso machine, digital newspapers, Bluetooth speaker, full-length mirror, in-room greenery and complimentary Wi-Fi Internet. Features 2 Full beds, sitting area, HD Smart TV, cotton robes, yoga mat, organic bedding, Nespresso machine, digital newspapers, Bluetooth speaker, full-length mirror, in-room greenery and complimentary Wi-Fi Internet. Features 2 Full beds, LA views, sitting area, HD Smart TV, cotton robes, yoga mat, organic bedding, Nespresso machine, digital newspapers, Bluetooth speaker, full-length mirror, in-room greenery and complimentary Wi-Fi Internet. Features 1 King bed, Sunset Boulevard view, sitting area, HD Smart TV, cotton robes, yoga mat, organic bedding, Nespresso machine, digital newspapers, Bluetooth speaker, full-length mirror, in-room greenery and complimentary Wi-Fi Internet. Features 1 King bed, Sunset Boulevard view, living area, HD Smart TV, cotton robes, yoga mat, organic bedding, Nespresso machine, digital newspapers, Bluetooth speaker, full-length mirror, in-room greenery and complimentary Wi-Fi Internet. 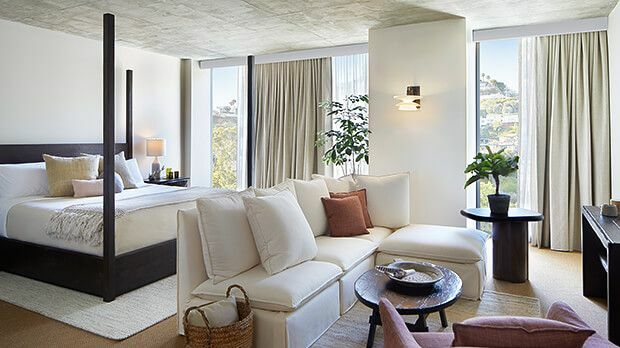 Features panoramic LA views, separate living and dining room with step-out balcony, and HD Smart TV, cotton robes, yoga mat, organic bedding, Nespresso machine, digital newspapers, Bluetooth speaker, full-length mirror, in-room greenery and complimentary Wi-Fi Internet.